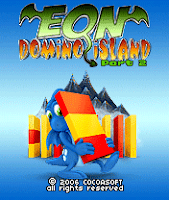 Eon: Domino Island 2 (by Cocoasoft) — Mobers.ORG — Your Daily Source For Mobile FUN! This addictive puzzle game is set in Eon the Dragon's rich and colourful world. The picturesque world is once again a place for the new Eon's adventures and is now filled with various domino puzzles that challenge every player and present him with fun that ranges from the easy to the master level. Simple rules with a myriad of combinations make these puzzles easy to play and yet they manage to preserve a challenge to casual players. Players, who seek more rewarding games, have on offer a number of more complex puzzles. Each puzzle includes a set of different dominoes, each with unique abilities. The player's goal is to tap all of the dominoes and thus open the portal into the new level with a new, different puzzle. 30 levels span through 3 distinctive worlds of the mystical island. The game includes enchanting music which creates relaxing moments while the player's brain is being teased by the puzzles. Each set of puzzles represents one world and spans from easy to hard levels in order to satisfy both casual players and players, who seek an authentic challenge in addition to mere entertainment. Colourful, cartoon-like graphics that were excellently accepted in the previous games featuring Eon the Dragon and his friends now come with increased colour and greater detail. Three totally different worlds are set on a fantasy island from which the only way home leads through the diverse and wonderful lands jam-packed with dominoes. 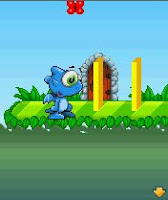 The striking and cheerful music score - including Eon the Dragon theme music - sets the overall mood to the game and makes it even more enjoyable.